Aiken, S.C.-based SEAMS — the National Association for the U.S. Sewn Products and Textile Industries — will celebrate its 50th anniversary at its Spring Networking Conference to be held May 16-17, 2017, at the OMNI Grove Park Inn, Asheville, N.C. The conference is titled, “Shaping the Next 50 Years,” and will focus on trends and opportunities for its member companies in the future. Germany-based BASF AG has increased the prices in Europe for propionic acid by 50 euros per metric ton and for formic acid 85 percent concentration by 40 euros per metric ton. The company reports it will raise the prices for other concentrations of formic acid accordingly on a pro rata basis. Americhem, Cuyahoga Falls, Ohio, has received ISO 14001 certification for its Suzhou, China-based manufacturing facility adding to its existing ISO 9001 and ISO 13485 certifications. Both AmeriPride Services’ headquarters in Minnetonka, Minn., and its office in Minneapolis have obtained the Environmental Protection Agency’s (EPA’s) Energy Star® certification, which signifies that the buildings meet the strict energy efficiency performance levels set by the EPA and perform in the top 25 percent of similar facilities in terms of energy efficiency. Switzerland-based Archroma has introduced a portable version of its Color Atlas system. The Compact Color Atlas contains the original Atlas’s 4,320 color swatches in a 1-inch by 1-inch size, which reduces the Atlas from six to two slim volumes. Loudon, Tenn.-based DuPont Tate & Lyle BioProducts has unveiled a new hangtag program for its Susterra® brand. 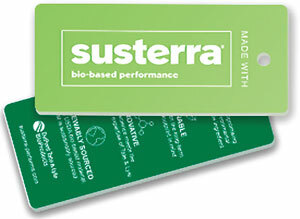 Companies using Susterra propanediol to produce bio-based films used in apparel or footwear applications may use the hangtags to differentiate their products and offer traceability.